Only Carpenter Realtors® has a complete marketing program that exposes a home for sale to more potential buyers. Our goal: help sell it faster and for more money. If you’re selling a home, don’t you want to reach every possible buyer in every possible way? Read this, then ask yourself if you think any other broker has a program as complete as this to help you achieve your goal. You see, if you’re thinking about listing your Indianapolis single family home or condo for sale? Carpenter’s exclusive Home Marketing System is designed to help you sell your Indiana home at the best possible price, for the most favorable terms, in the shortest period of time and with the least inconvenience to you. It’s a proven system, providing wide exposure for your home, from complete internet presence to home for sale mass media and online advertising. No one else has as comprehensive a program as Carpenter. Not only do we help develop an effective pricing strategy for your home’s sale, but we will advertise and market your home more aggressively than anyone. Your home will be visible and seen by more prospective buyers. If you’re being told that setting a price and putting a sign in your yard is most of the work … and that a broker’s own website will do the rest, you’re only getting a third of the story. • callcarpenter.com – Our website, one of the most-visited sites for local home searches, provides detailed information about your property and your neighborhood. More complete more detailed and more user-friendly, it’s the information buyers are looking for in an easy-to-use format. • Carpenter Agent Websites – Every Carpenter associate has a custom website on which their clients are searching for homes. That means hundreds of local websites on which your home is featured, each with hundreds of unique visitors each month. • Local and national internet exposure – We all know homebuyers use the internet to search for homes. What we don’t know is which website the future buyer of your home is using. Your home receives exposure through dozens of national websites such as trulia.com Realtor.com, frontdoor.com, zillow.com, google, Yahoo!, ReloHomeSearch.com, homes.com and local websites. No one exposes your home to buyers on more real estate search sites than Carpenter. No one. If a home buyer is online, they’ll find your home. • trulia.com and HomeFinder.com – Trulia.com is the second-largest, fastest-growing national real estate search web site. homefinder.com is the real estate website for two hundred major daily newspapers. We enhance every Carpenter listing on both, reaching 20 million+ buyers each month. Carpenter listings are featured homes: more photos, more details, more contact information. This generates more online showings, more calls for information and more activity on your home. • GPS HomeSearch – We all know that buyers select homes in a neighborhood in which they want to live. GPS HomeSearch makes that easy. On a buyer’s smartphone, callcarpenter.com locates their GPS position and displays homes for sale nearest them. They can quickly download details on your home or have your home suggested as an option while they look nearby homes! • Virtual Tours – An exclusive agreement with VisualTour, the nation’s largest virtual tour provider, provides every Carpenter listing with a complete virtual tour package. This includes a guided tour through your home featuring motion and music, full syndication to all VisualTour web sites and a video tour on YouTube. More exposure via more outlets means more potential buyers for your home. • YouTube – youtube.com/mycallcarpenter features a video of every Carpenter listing, searchable by address, price and location. Not only is this more exposure for your home, but it’s more easily found by the search engines when buyers want details on your home for sale. • Your Own Website – Your Carpenter agent can also create a customized, personal website for your home. Imagine sharing www.1234MainSt.com with your friends and neighbors, and imagine the additional exposure your home receives. • Indianapolis Star Open Houses – Some may have you believe that “newspaper is dead,” that “no one reads newspapers any more.” Well, there are a half-million adults who do read the Indianapolis Star each Sunday, many of whom are buyers looking for the day’s open houses. 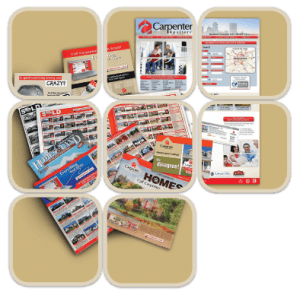 Carpenter is the only company advertising every open house every Sunday in Indiana’s largest circulation newspaper. We don’t believe you can afford to miss these potential buyers. • Indianapolis Star Home of the Day – Only your Carpenter agent can showcase your home with a full-color display ad in the main news sections of the daily Star. This generates interest in your home and more importantly, phone calls. • community papers – another quarter-million potential buyers reached. • TV Showcase of Homes – Our exclusive TV Showcase of Homes features 60 current listings every Saturday morning on MyINDY TV, channel 23, at 10:00 am. Another way that your home is exposed to thousands more potential buyers! • Call Carpenter For Homes magazine – Carpenter’s exclusive “Call Carpenter for Homes” full-color magazine is distributed throughout Central Indiana. Your home will be seen in 40,000 copies along with over 1,750 current listings! • Direct Mail – Tens of thousands of color postcards are mailed to our sellers’ neighbors and to targeted prospects every month. • Yard Signs – You’ll get strategic placement of our Carpenter Realtors® uniquely shaped and colored yard sign. Our sign stands out among the clutter and is arguably the most recognized in Indiana. Your home will be more visible to more potential buyers. • Take-One Flyers and Boxes – In front of every home we place our exclusive Take-One Boxes. Every buyer wants information on your home for sale and we provide it! These flyers contain property information featuring full-color photos and highlights of all of your home’s features and benefits. Even better, we ensure that the boxes remain filled with flyers. • Feature Cards – Strategically placed throughout your home, feature cards remind visitors of the best features your home offers. • Broker Listing Cooperative (BLC) – Formerly known as the Multiple Listing Service (MLS), the BLC offers information and photography placement offers a competitive presence for each listing on the computerized multiple listing services. • Internet Lead Management – Believe it or not. 80% of all internet real estate inquiries go unanswered. WHAT?!?!? At Carpenter, every inquiry is responded to within two hours, seven days a week. Our commitment: buyers get the respect, service and answers they deserve. • LeadingRE® Relocation Network – Carpenter is central Indiana’s top company for this international network of the largest, most successful independent real estate companies. Leading RE® offers an exceptionally strong presence in key Midwest cities like Louisville, Columbus, Cincinnati, Chicago, Cleveland, Nashville and Memphis; markets most likely to have families relocating to central Indiana. Each year, over 50,000 families are successfully transferred through the Leading RE® network. What does that mean? It means more potential buyers for your home. • Home Tour Caravans – Weekly home tour caravans mobilize Central Indiana Carpenter associates to see your home and better explain its features to potential buyers. • Custom marketing materials – Our agents can produce custom materials to help expedite your home’s sale using the latest real estate specific software. • Home Warranty – Plans are available to make your home more attractive to home buyers throughout central Indiana. • We have the largest footprint in Indiana – With thirty (30) branch offices and sales associates located throughout Central Indiana, we have more agents helping to market and sell your home than anyone in the state.